The Secrets to Masterful Meetings: Ignite a Meetings Revolution! How often have you had this same thought? Why do we tolerate bad meetings? Consider the last meeting you attended that was run by someone else. How many of these pitfalls were evident? Did not start on time. Key issues were not addressed. The meeting was not worth the time. Have we lowered the bar so far that bad meetings have become the norm? Enough is enough. It is time to ignite a meetings revolution. How Do You Transform a Bad Meeting Culture? 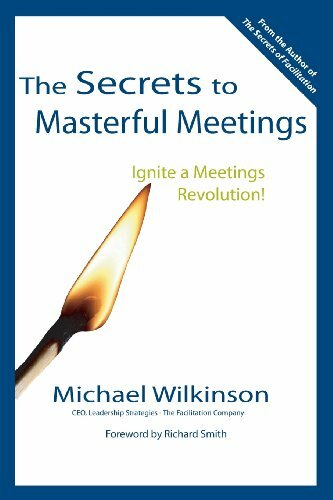 In The Secrets to Masterful Meetings, Michael Wilkinson provides leaders with a step-by-step guide for igniting a meetings revolution. The result: a complete culture transformation in which bad meetings become unacceptable! This book supplies a step-by-step guide for igniting and sustaining a meetings revolution which, if successful, will permanently change the way meetings are run in an organization. In his book, Wilkinson recommends that executives empower their people with a set of meeting rights. He then provides a comprehensive meetings transformation program that equips meeting leaders and meeting participants with tools for masterful meetings. 10 Meeting Rights to empower every participant. 10 steps to transform your meeting culture. 15 meeting problems and how to address them. 4 strategies for eliminating unneeded meetings. 6 tips for getting meetings started on time. 3 robust tools for resolving disagreements. 4 techniques for rescuing poorly run meetings. 14 strategies for maximizing virtual meetings. 6 agendas to use to gain the results you want. 4 checklists for executing Masterful Meetings. Give a copy of this book to everyone whose meetings you attend: a gift that truly keeps on giving!